Your challenge this month centers on clarifying communications. Misunderstandings, delays, and poorly functioning equipment can be at the core of your frustration. This is not the time for sweeping changes! Take inventory of your health; assess your strengths and weaknesses. Accept responsibility for your body by eliminating things that undermine your health and making changes that will enhance your well-being. Home and family need a little extra attention. Relationships with siblings fare best through July 13, and then you may want to spend more time nesting. Philosophical differences with parents can escalate after July 17, but if you want to bridge the gap you have good incentives near the time of the lunar eclipse on July 28. Confusion creates a gap in your love life, and you may never clarify the situation until you’re honest about your feelings. Denial is your enemy. You know the feeling —the carrot on the stick — and there are plenty of reasons to think you’ll never figure out how to stop the game. 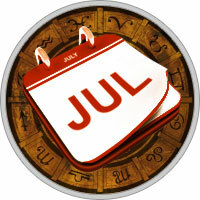 Mercury’s retrograde from July 12 to August 5 brings intuitive insights that provide captivating solutions. Defying logic is not usually your style, but try it just once. Everything is at a standstill anyway. What have you got to lose? It may be just as simple as ramming that stick into the nearest tree. Tacky situations at work escalate late in the month, but you can step out of the fray and remain objective. If it’s not your battle, then why are you drawing your sword?